This level has medium difficulty. 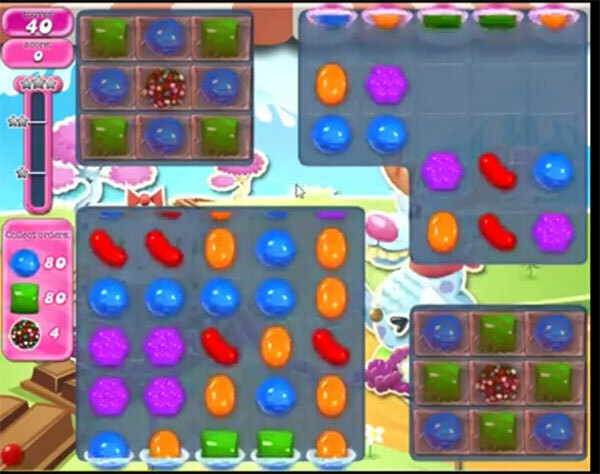 For this level try to play more from left bottom part of the board where you have more candies and try to make colorbomb. Combine colorbomb with blue or green candy to complete the order. I don’t know when the game changed but I have to get 5 color bombs to pass this level not 4. 5 color bombs, 100 green candies, 100 blue candies! I’m finding it a little difficult. Would be easy with 4 bombs, 80 green, 80 blue. I agree. Asking for 100 green, 100 blue, 5 bombs. I made 80 of both colors and 4 bombs several times. This description doesn’t match what it is really ask for. Yes. 100 of each and 5 color bombs. Ugh! Nasty level. I have come so close so many times. I am either lacking a color bomb or am a couple of one color or the other from winning. I used all of my color boosters up which didn’t help at all. Eventually I expect and hope for a lucky board that will allow me to win . Exactly…I need 5 color bombs not 4! How exactly can you tell me to beat this level!